The birds were appearing from nowhere. Not from a cloud bank, not from behind treetops, not from low on the horizon. From nowhere but outer space. Staring skyward from my layout, they materialized as dots of black pepper far in the stratosphere, dropping ever so slowly until the sun caught a glint of white, floating earthbound and morphing into never-ending strings. Slowly, we could start to hear them. And I was also hearing something else, a low evil hissing coming from the layout blind to my left. My buddy Jim McConville was ominously whispering the name of the feathered beast, his greatest nemesis, from the layout next to me. Shikaka! The white devil! In the Jim Carrey movie "Ace Ventura," Carrey chases "Shikaka," the great white bat, to help a lost tribe in a fine piece of sillyness. Carrey eventually catches the bat, of course, but McConville has never really caught snow geese. We all grew up wanting to be bigger, faster, stronger, successful, and to possess effortless social graces. Jimmy Mac is all of the above. 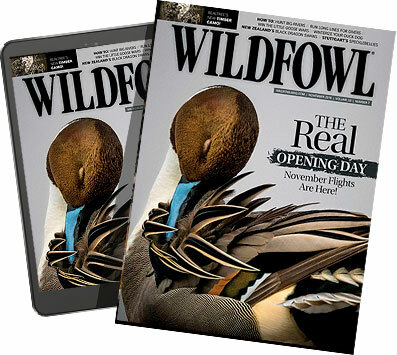 Perfect family, too, and he even seems to be one of the few people in the outdoor industry to make a decent living (he's the national sales manager for WILDFOWL and other magazines). The former Ohio State defensive tackle is an exceptional wingshot to boot, and he's so animated he should probably have a TV show. But in his otherwise perfect life, he is cursed in one regard. As avid a waterfowler as he is, he has never scored on his great white nemesis. Shikaka&apos;¦snow geese. They can sense his presence like Vader senses Skywalker. By contrast, I've generally had good luck with snows, and convinced Jim if he'd extend his sales visit to our Peoria offices we could run to Missouri in early March and cover the prairie with dead Shikakas. He ditched the dress shoes, loaded up on Wal-Mart sweats, and we burned a line west in a rented Impala as Jim sang along to Prong's '80s death metal "Snap Your Fingers, Snap Your Neck"). We hooked up with Max Cochran and Cooper Olmstead with Central Prairie Outfitters. My buddy Randy Rawlins assured me they are unrivaled snow goose guides, and he was right. I'd never seen guys work so hard, deploying full-bodied fakes for snows. The setups were just perfect: layouts so dug in and stubbled you could hardly detect them. Instead of pleading to migrators from a giant perma-spread, like most guides, Max and company stay mobile and hostile, scouting and setting up on a new X every day, right where the birds are, moving hundreds of dekes in the darkness. Morning rallies of shooting broke right at dawn, then slowed, as we lay in the freezing mud and 15-degree cold. With the snow and damp breeze, my feet froze, but we killed 15-25 birds on an all-day hunt. On the first day-and-a-half, probably 10,000 geese or more were within 60 to 200 yards, but would not finish. Frustrating. We killed the time cracking jokes with Bill Willroth, owner of Dakota Decoys, and Dave "Buddha" Stamp, Max's grandpa. At times we'd have 1,000 birds on us, some actually in range, and we'd make the tough call to wait for more birds and at times got none. That's snow goose hunting. It was on the second day that the stratospheric tornado descended. I'd heard always that some geese migrate much higher than you can believe, so high you can't see or hear them, but I'd never seen it. It was a slow afternoon as we reclined in the layouts, mentally tuning out the prattle of the e-callers, when the teeny black and white dots appeared from up high like floating specks of salt and pepper. The specks grew into flocks, which in turn grew tails that became other strings, and the numbers built, the lowest finally sucking nearly into range shockingly quick. Like magic. And Jim, carrying on next to me, in a loud whitetail-hunting-TV-show-whisper&apos;¦Shikaka! Over the building roar, again and again, "shikaka&apos;¦.shhhhhikakaka." The birds were now so beautiful against the bright blue sky, lit up stark white and black, with loads of gorgeous white-headed blue geese, just stunning in the mix&apos;¦our hearts were pounding as Jim's Curse of the Shikaka was finally ending. This was going to be a massacre. They were now under 100 yards, the e-caller sucking them in with the chatter of grunting, feeding, calling snow geese, a seductive never-ending lie. Jim hissed one last "shikakaaa" and we froze, silent, poised to shoot&apos;¦but they would not finish. The Jimmy Mac factor still applied. They slid all around and skidded into 40 yards, then flared and pumped skyward. We were under a tornado that would not touch the ground. So frustrating. As it built, the swirling birds were dizzying. They grew paranoid and finally our guide called it at 35 yards. We dropped six or eight birds from what should have been a slaughter if they'd just come 10 more yards. Instead, we emptied our guns and watched hundreds pump up out of our zone and fade like white smoke into the sky. The white devil! The problem was simple: despite state-of-the-art spreads and private ground, we just did not have new migrators. These were the same 30,000 northwest Missouri birds that had been in the area for weeks, including the week prior when I was supposed to be there with the Rig'em Right crew. My buddies Joe Thole and Alex Langbell, and his gorgeous daughter Sierra had pounded the unholy hell out of them in a snowstorm, killing 200. Those text messages had killed me! Big Jim did not break his shikaka curse, but it was still one of the most fun trips. The best memory? Easy. A small group of birds slid into gun range and after hissing shikakakaaaa Jimmy Mac sat up and like a monster in a crypt from an old movie, his huge shoulders brought the entire layout blind up with him. He had wedged in the layout and it stuck to him like a mummy bag. He got off a few shots but I don't think the geese noticed. I laughed so hard my under-developed abs were sore. A week later Matt Cagle and another Rig 'em Right crew went to SoDak and smashed the birds, shooting hundreds. That's snow goose hunting. You shoulda been here tomorrow! But I could not really complain. Two weeks prior, I'd scored a whiteout. The Albanian Goose Mafia had shown at my door, and kidnapped me for a weekend, as is their custom. This year Chris Vangel, the ringleader, had a brand new truckmousine, a new crop of t-shirts featuring the Albanian flag (looks like a goose/dragon love child) and what appeared to be the same gnarled cigar from the year before sticking out from under his monster mustache. His new black Ford Raptor practically snarled in the driveway. Chicago tough guys Vangel and Phil Thiem head down to Jonesboro every year to hunt with Roy Rametta, who parks a snow goose spread that can be seen from outer space right in the middle of a great southern stretch of flyway in northeast Arkansas. The action centers on a pit with a stereo system, and when a south wind picks up and gets the decoys flapping on the southern end of the flyway, it can be as good as it gets. With mild weather, the only tough part about hunting with Roy is watching the specklebellies circle you at 20 yards days after the season on them closes. It wasn't 9 a.m. and Rametta had repeated his opening day magic. The guy is a pioneer of snow goose hunting in the area, and a maestro, with prime ground that can fill with birds anytime — it's simply a place they want to be. Which is why we let 10,000 birds go past us at 20 yards at dawn (not easy!) streaming by like great white salmon in a river. What a sight! But we had to let them go eat. Just as Roy planned, they came back in smaller groups and we bagged 80-something. A pair of incredible long distance shots were made with then-brand-new Speed Ball BB loads I shared. Some local landowner kids jumped in our pit while we were at lunch and 2,000 birds tried to land on their heads while we were eating. Of course...shikaka! My favorite memory from this run was of Rametta's old buddy Harpy, a country boy and ladies man on the order of Uncle Si from "Duck Dynasty." He wore what looked like a turkey box call around his neck and I kept wondering what the heck it was. Finally a group of 12 geese came clear in to 20 yards and we shot every one of them. Harpy pulled out the mystery box and blew into one end. It made a perfect steam whistle noise, and he shouted "That there was a TRAIN wreck boys!" Every hunt with Rametta and the Albanian Goose Mafia is a train wreck of laughs, that's for sure.